For anyone who has closely tracked the evolution of California’s ever-worsening drought, it has been apparent — from the very beginning — that something is very wrong with this mostly manmade catastrophe. The purpose of this exposé is to reveal the evidence, some scientific and some anecdotal, which indicates that this historic and unprecedented drought has been literally engineered from start to finish. Just like LA’s Hollywood studios have produced so many disaster epics, the Government-Corporate Complex has quite purposefully staged this catastrophic drought throughout the statewide ‘set’ of California. Again, the thesis of this essay is that both the U.S. Federal Government and select Military-Industrial Complex corporations have conspired to create the California drought. While that may sound like a conspiracy theory to some, the growing body of evidence points directly to Government-Corporate Complex* complicity. California is the eighth largest economy in the world. It’s agricultural industry produces a massive amount of food for the USA as well as the world-at-large. The IT Industry of Silicon Valley alone contributes a significant amount to the state GDP. Likewise, the Military-Industrial Complex owns and operates major enterprises across the entire state of California as does the Motion Picture Industry. When considered in the aggregate, these sectors of the state economy also make up a substantial portion of the U.S. GNP. Therefore, it is very easy to see how putting a HUGE dent in the California economy would affect millions of people and many communities, as well as numerous corporations and companies operating both in-state and nationwide. 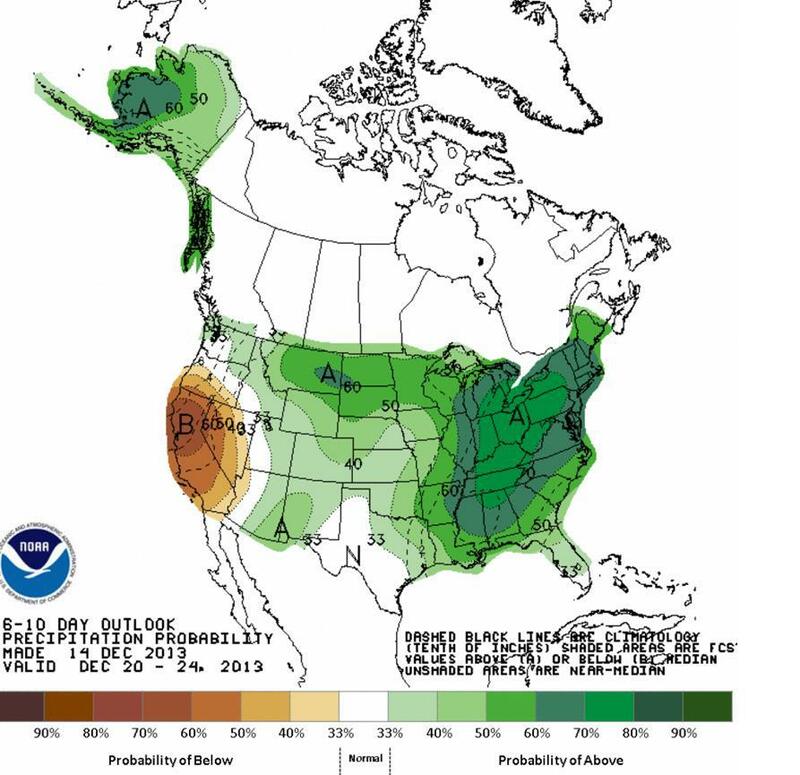 Obviously an historic 1200 year drought will have countless impacts, both major and minor, on California agriculture. The longer this predicament continues, the greater the effects on the state economy. A drastic drought-caused reduction of the water supply also affects other water-intensive industries such as fracking and oil drilling. Even those businesses which do not rely on water, except for office water fountains and executive showers, are being affected. Why would any relocating employee ever want to buy a home anywhere there might be water rationing for the foreseeable future, or worse — no water at all?! “The Golden State” of California was quite purposefully chosen as the site for this geoengineering ‘experiment’ with a quite purposeful agenda. This agenda has different components. The climate engineering component is by far the most far-reaching and consequential and has been operating for some time now. However, in this case, climate engineering via atmospheric manipulation has been taken to an entirely new level and in a very dangerous direction over the past few years. California has been a trendsetting state since its inception in 1850. What happens there can often have profound repercussions for the rest of the nation. Like so much that comes out of Southern California (especially LA, the drama capital of the world), the influences can be rather melodramatic and impressive. Hence, any drama that is staged there can be easily used to impress the other 49 states. After all, isn’t that exactly what the Film Industry has done for several decades … only it isn’t just the USA that is affected by what comes out of Hollyweird Hollywood these days, the whole world can be quickly touched or deeply moved by its cinematic output. 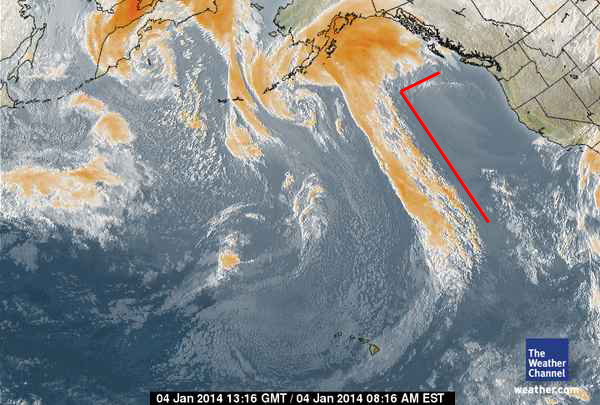 What does this have to do with an obviously engineered statewide drought? Everything the geoengineers do has much purpose behind it, as well as multiple objectives. Just like the 9/11 false flag terrorists attacks were staged to “shock and awe” the American people into submission, the California drought is being utilized to soften up the citizenry to accept geoengineering 24/7. Not only will they tell us that it is necessary to conduct this weather modification program in order to compensate for a debilitating statewide drought, they will also invoke National Security. Because of the seriousness of this unending drought, they can now point to sheer survival, as in where else are we going to grow our food. Nothing produces quicker widespread acceptance, of any misguided scheme, like an existential threat. 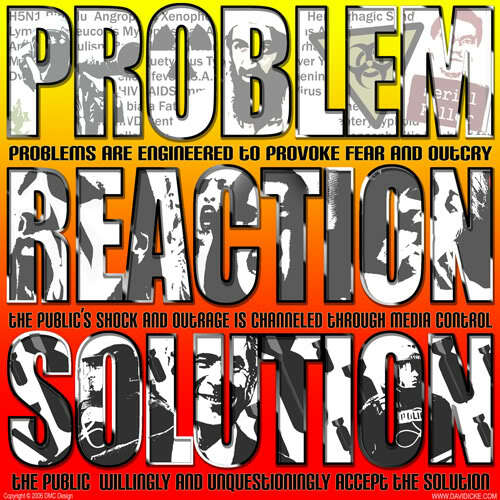 Employing the Problem-Reaction-Solution MO of Hegelian Dialectic fame has always been their most effective way of controlling whole countries and populations, cities and communities everywhere. In the case of California it will no doubt work like a charm as the drought inexorably chips away at every last vestige of resistance to a fully geoengineered planet. Their thinking is that if the sun-loving, fun-loving residents of California will accept chemtrailed skies and HAARP-induced rain events, surely the other 49 states will go for it. Direct the course of the bellwether state of California and the rest will eventually go along, if not to just get along with their neighbors. Likewise, take down the biggest state in the union — HARD — and the rest will gladly climb on board the coming geoengineering train wreck. One of the primary goals of the CA drought scheme is manufactured consent. 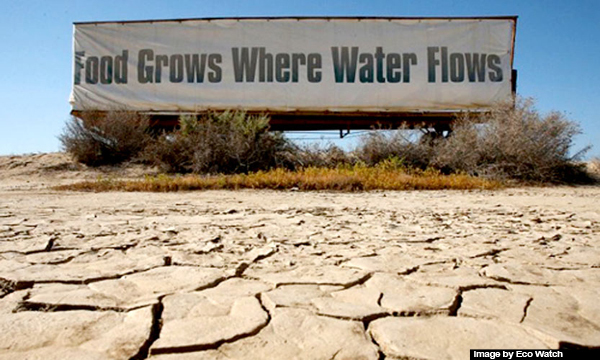 After years of unrelenting drought various sectors of California’s economy have had enough. Farmers big and small have been pushed beyond their limits. Many have decided not to plant until the drought ends. The Agriculture Industry supports many other businesses throughout the state which are also feeling the pain. In view of the ongoing agricultural disaster, anyone associated with farming and husbandry is now beyond desperation. 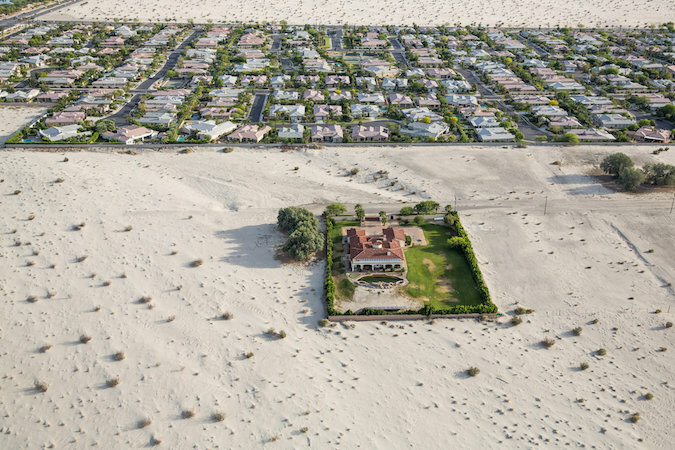 A whole way of life is slowly disappearing across large swaths of California. For obvious reasons the real estate market is likewise suffering, particularly in those areas where freshwater supplies have always been unpredictable or problematic. As a result, relocations are way down as are new housing starts, regardless of what the falsified government statistics portray. This has made business in general a rather tedious affair because of the difficulty in relocating key employees from around the country or around the state. Who wants to pay way too much for an overpriced house anywhere, especially if it’s located in a waterless region? The Motion Picture Industry had already taken a new approach toward finding filming venues outside of the state of California after the recession hit hard in 2008. With the increasing scarcity of water, this movement abroad to foreign nations, as well as to significantly less expensive shooting locations in the other 49 states, has now become common practice. Hollywood is quickly reducing its filming footprint statewide and will continue to do so in the face of water shortages across the drought area. In this fashion consent can be very easily manufactured concerning those government and corporate initiatives which the geoengineers are quickly moving from the drawing board to manifestation. They know that receiving the approval of the citizenry to proceed with their geoengineering agenda is much easier than attempting to foist it on the whole state, or on the entire USA, without any consent as they have already done in secret by way of various covert geoengineering operations. The crux of that agenda is, of course, the enactment of legislation which will grant broad powers to implement a nationwide program of geoengineering, not too dissimilar to what they as currently doing under the radar. Using the Problem~Reaction~Solution model of social engineering in the current context of an extremely problematic and protracted drought, the many reactions are being clocked by all the appropriate government agencies. Ultimately the perfect solution will be presented by those who created the problem in the first place. If they are already geoengineering 24/7, why, pray tell, would they seek approval from the people to continue doing it? Because recently there is now a massive groundswell of very hostile opposition to the geoengineering techniques which people can see and feel. 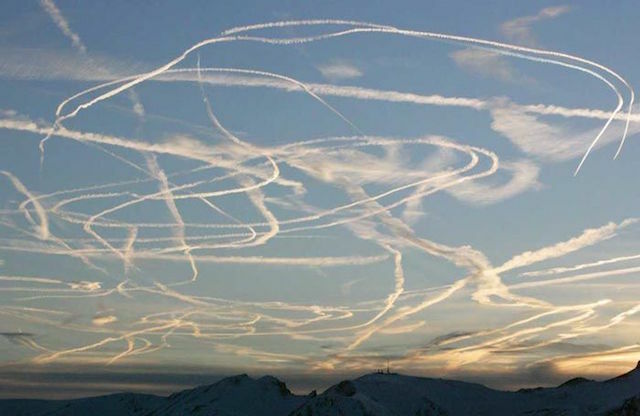 The internet has spawned a rapidly growing network of environmental activists, health advocates and political operatives who are quite aggressively spreading the word about Chemtrails. They have been extremely successful at raising awareness throughout every sphere of life. When indisputable photo-docs like the following are being circulated far and wide, the geoengineers have a lot of extremely uncomfortable explaining to do. The systematic aerosol spraying of chemtrails throughout the skies of the USA is the most flagrant example of unlawful geoengineering at work. The U.S. Military has been conducting these and other similarly illegal programs for many years completely under the radar and ostensibly in the interest of ‘national security’. Except that chemtrails can no longer be kept off the radar screen so ubiquitous and intense have the spraying operations become. The following important article lays bare what many have known for years, but which only recently was confirmed by a real military insider. Simply put, a growing segment of the U.S. citizenry is now extremely aware of the clandestine chemical assault that chemtrails represent. They are also grimly aware of the extent to which sunlight is being artificially blocked. Particularly in the sunny states like California and Florida are the strong sentiments growing solidly against chemtrail spraying. So angry are many who see the amount of natural sunlight diminish by the day that this cause has served to unify disparate environmental activist and health advocacy groups across the whole spectrum. The geoengineers now know that they can no longer get away with spraying under cover of darkness at night or above the cloud cover by day. The chemtrail cat is out of the bag and will only make more mischief for them. As a result, their immediate goal is to sufficiently manufacture consent so that the public will be manipulated into the ‘legal’ act of uninformed approval via their government representatives. 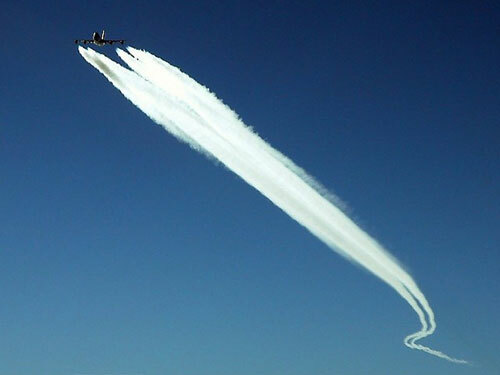 Once a sufficient percentage of people are on board with chemtrailed skies — all day, every day — one of their main goals will have been achieved. Broad acceptance in a large and powerful state like California permits them to use the success which will then be duplicated in all the other ultra-liberal coastal states such as New York, Massachusetts, Washington, Oregon, Connecticut, etc. When this milestone has been passed, it’s just a matter of time before all the blue states ignorantly climb on board the geoengineering train(wreck). In this manner the geoengineers have now been forced to ‘legitimize’ their geoengineering programs by compelling key state legislatures to approve the new geoengineering laws which were written years ago for this very moment. After enough states have signed on to the ‘new’ out-in-the-open geoengineering agenda, the geoengineers will then be well positioned to propose over-arching national legislation in Washington. With this quasi ‘approval’ of the American people in hand, the geoengineers will then be able to advance their agenda globally. Their ultimate intention is, after all, the expeditious implementation of a worldwide geoengineering regime. This approach will be pitched as the answer to the inexorable and ever-destructive Global Climate Change being witnessed across the planet. Just as California has borne witness to the ravages of Global Climate Change, so too have many other states and cities, countries and continents. What is the ultimate aim of this carefully executed scheme? The top goal of their rapidly unfolding agenda is to pass a series of profound pieces of legislation and treaties all of which aim to impose new laws concerning geoengineering. Of course, they will go by different names like weather modification and atmospheric testing, solar radiation management and stratospheric aerosol engineering among other forms of geoengineering. No doubt that their biggest goal is to have climate engineering universally accepted as a legitimate way of responding to Global Climate Change. Once they have accomplished this feat, they will be free to keep their chemtrail jetliners in the air 24/ 7 spraying anything and everything on the planet below in their feeble attempt to slow down the inevitable. As a global antidote to Global Climate Change, the geoengineers are operating under the incorrect understanding that shifting climate patterns can be ‘fixed’ with a dose of chemtrail/HAARP medicine. Some of these highly misguided and profoundly mistaken PhD geoengineers really believe that the pharmaceutical approach will save the day … as well as the planet from the incessant devastation caused by global warming and/or global cooling, global drought and/or global deluge. Just like many a cancer patient who might receive a three-pronged medical attack of radiation, chemotherapy and surgical procedures in order to force the cancer into remission, geoengineers believe they can duplicate the process to save Mother Earth. Only in this case they are utilizing HAARP frequencies, chemtrails and other forms of terraforming techniques ‘to put things right’. For many of them, total planetary weather control is the last frontier here on Earth. They have been experimenting over many decades now with this pharmaceutical approach, all to no avail except, that is, to significantly exacerbate many years of Global Warming. Fabricating (or contributing to) a Global Warming scenario has always been their main goal. It’s extremely important to understand, especially for the Global Warming deniers, that it was the geoengineers who have contributed significantly to the recent period of planetary warming over the past few decades. That both the mean and average temperatures across the planet have steadily risen is without question, no matter how you view or slice the data. Putting the science aside completely, who would deny their own experience — in their own locale — regarding the progressively hotter years, especially over the past two to three decades? So, what’s the point? The VERY critical point? What appears to be the case is that the geoengineers quite deliberately took advantage of a natural cyclical global warming phase which they observed from the indisputable scientific data going back many decades. They then cooked up a scheme to purposefully exacerbate the warming by way of various geoengineering techniques and technology. Because of the historical realities, they were then able to claim that much of global warming was directly due to anthropogenic causes. Yeah, they knew they were partly responsible; however, we just don’t know how much warming is due to geoengineering, how much is nature-driven (e.g. natural methane releases), and how much is the anthropogenic (e.g. industrial carbon emissions). 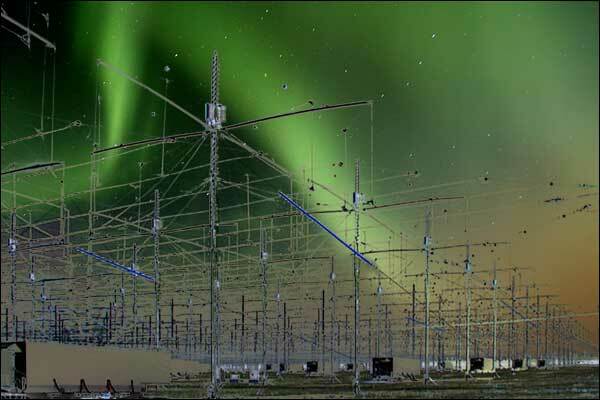 When HAARP was pumping billions of watts of energy into the ionosphere, what could anyone expect except some very serious blowback on the planet and humanity. There are many other secret government-sponsored geoengineering initiatives which were also taken that are well beyond the scope of this essay. Suffice to say that their multi-decade plan to fabricate a full-blown Global Climate Change emergency has been hugely successful. It constitutes one of the key pillars of their plan to impose a New World Order. Toward that end the very basis of their One World Government hinges upon total control of all of Earth’s resources, as well as all of the oceanic and continental weather systems. Only in this manner can they foist a worldwide regime of command and control that will be viewed by the masses as a necessary evil to save humankind from itself. Each component of the overarching implementation plan has been written about since the end of World War II. The Report from Iron Mountain offers an excellent example of how far they have come to executing their clandestine agenda in broad daylight (although now considerably dimmed daylight from relentless chemtrailing). In the fabricated context of the Report from Iron Mountain it must be correctly understood that weather wars in particular are a viable option for exercising control over vast swaths of Planet Earth. In fact many of the manmade droughts and deluges, hurricanes and typhoons, superstorms and derechos have been geoengineered in very carefully selected locations, just as we have seen the drought in California. The following NOAA map shows just how much California has been targeted. What follows is an excerpt from an article concerning the ongoing water wars among farmers in the once fertile and highly irrigated Sacramento-San Joaquin Delta. In order to prevent this type of fierce competition for vital water supplies government will have to enter the contest(s) in order for them to be peacefully resolved, if that’s possible given the current catastrophic conditions of the historic California drought. California’s infamous CAFOs (Concentrated Animal Feeding Operations) are also coming under close scrutiny because of their well known water depleting and polluting operations. Here, again, there will be many opportunities for government to step in to much more closely monitor and regulate water usage, as well as the incessant water pollution from the CAFOs. The worse and longer the drought, the more enforcement will be required as the people throughout The Golden State are now experiencing with the first wave of radical water restrictions. Let’s face it, if Californians haven’t already: the entire state is now the object of a highly combustible experiment from north to south, east to west. Each ecosystem is a laboratory; each city and town a test tube in which the geoengineers attempt to conduct unprecedented experimentation. 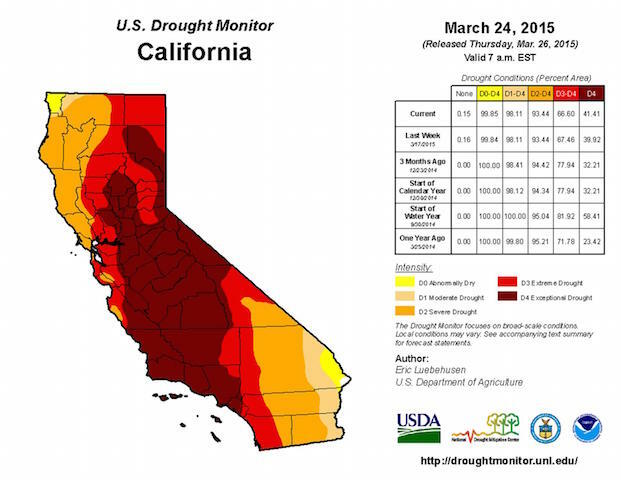 When a drought map looks like the one shown below, one can only imagine how many more Santa Anna wind-driven wildfire seasons the concerned communities can withstand. Satellite maps don’t lie. Each one possesses much data and accurately reflects the reality of the atmosphere which cannot be denied. These maps from The Weather Channel possess key signatures which clearly reflect the hand of man, not the hand of Mother Nature. For instance, the following satellite imagery of the West Coast clearly indicates meteorological conditions which are rarely if ever seen in nature. Hence, the only conclusion that can be drawn is that these are portrayals of manmade weather events; and, in this particular case, rain-depriving high pressure systems. Here are two more snapshots showing ‘mysteriously’ recurring and stalled high pressure systems just west of the coast of California. 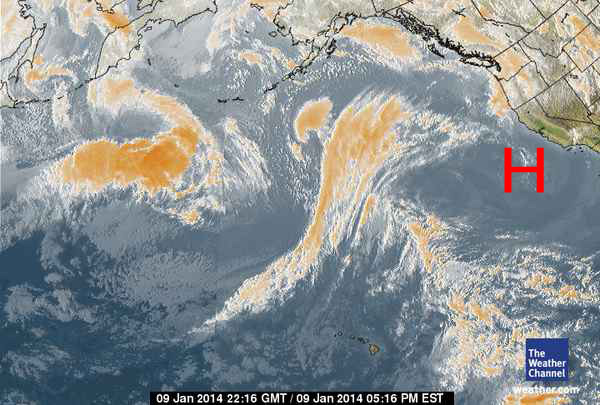 Lastly, here is one more satellite image taken almost two weeks later than the preceding one. Again, a high pressure system is shown sitting off the coast of California. Global Climate Change is now an ever-emerging reality. So is the practice of covert geoengineering. To what extent Global Climate Change is being caused by ever-intensifying geoengineering or natural solar cycles, greenhouse gas emissions or the heating of the Earth’s core, ozone layer depletion or the Pacific Ocean’s El Nino and La Nina patterns cannot be stated with any certainty. As long as geoengineering remains in the mix, it will be impossible to determine the weight of each natural and manmade cause of the current phase of Global Climate Change. This essay has presented a very narrow range of purposes of the geoengineering agenda. As with all global programs initiated by the Government-Corporate Complex, there are always multiple aims and objectives, none of which are mutually exclusive although some might appear to be. This is what confuses many climate change researchers and geoengineering investigators alike. While some components of the overarching agenda may appear to be working at cross purposes, they are always quite premeditated and calculated in advance of implementation to accomplish many goals at once. There are very significant reasons why CO2 emissions were identified early on as the ‘primary cause’ of global warming. The EPA tells us that “carbon dioxide (CO2) is the primary greenhouse gas emitted through human activities.” With this approach human activity, especially CO2-emitting industries, was officially recognized as the major trigger for the current phase of Global Warming. Anthropogenic global warming, as it is known, became the accepted mantra throughout the government and corporate sectors, as well as academia and scientific research. There is no doubt that greenhouse gases have contributed considerably to the prevailing atmospheric conditions conducive to Global Climate Change; however, natural methane releases are also exacerbating the present predicament. Methane (CH4) is a much more powerful greenhouse gas than carbon dioxide (CO2). Nevertheless, in their zeal to establish a new global control matrix based on human carbon consumption and CO2 emissions, the anthropogenic component(s) of Global Warming has been inaccurately isolated as the ‘only’ responsible culprit. Their ultimate agenda, of course, is to institutionalize a global government based on the regulation of industrial carbon (CO2) emissions and national carbon footprints. In this way every person and family, nation and state will be monitored for their carbon consumption and CO2 outputs. Corporations and companies, large and small, will be subjected to a whole new regime of carbon taxes and/or carbon credits. The marketplace has already been primed with the construction of various carbon-trading platforms. In this manner cap and trade schemes, as well as carbon offset scams, have found ‘legitimacy’ in the likes of the Carbon Trade Exchange and Chicago Climate Exchange, respectively. Truly, the Government-Corporate Complex has found the perfect control mechanism by which to regulate all human behavior, both individual and institutional. In the end it’s all about exerting a new form of control over the entire planetary civilization through carbon taxation policy and totalitarian enforcement. Which brings us to the conclusion that the California drought is being geoengineered and showcased for a variety of purposes. First, it is an opportunity to overlay a new statewide control matrix linked directly to weather modification and climate engineering. It also provides the Government-Corporate Complex the ideal pretext to take full control of all natural resources throughout the state. In so doing all existential threats to the environment will become the ‘responsibility’ of the government. There are several other reasons to undertake such a mammoth geoengineering undertaking and attempt to keep it going unknown to the public. However, the single most important is to successfully pass geoengineering legislation worldwide so that the current secret agenda can come out of the closet, once and for all. It takes way too much time and energy, money and resources to maintain such a planet-wide covert black operation as they are doing now. As more and more people begin to wake up to the fact that their sunlight is being systematically stolen from them, and, in return, they are being continuously exposed to toxic chemtrail and chemcloud chemicals, they are getting mad. Such government overreach and outright criminality are unacceptable by any standard. We trust, however, that the daily chemical assaults, now committed in broad daylight by those ubiquitous chemtrail jets, will NOT be tolerated by anyone in the future who knows the truth of this exceedingly grave matter. There is much more evidence — scientific, anecdotal and circumstantial — that indicates human manipulation of the atmosphere to bring about the unparalleled California drought. Each week, each month and each year that goes by reveals new information and data which clearly indict the Government-Corporate Complex. After all, the Government-Corporate Complex possesses technology to steer and intensify Category 5 hurricanes as well as to trigger 11.0 earthquakes. They have certainly mastered the science of rainmaking as well, so why don’t they bring to bear all the technology and techniques necessary to dampen the drought, if not terminate it altogether?! The following open letter well explains the urgency concerning various climate change treaties and legislation that are on track for passage this coming December 2015. 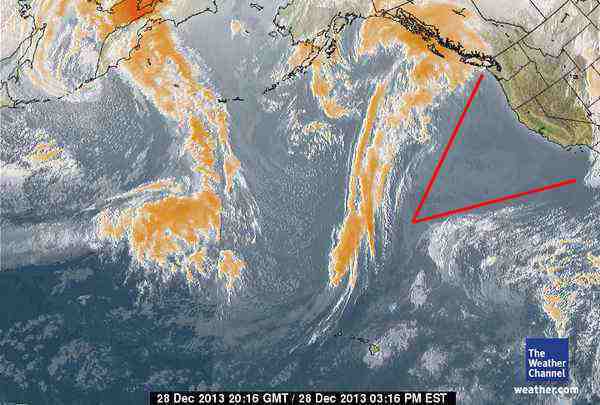 If there is one geoengineering initiative which requires immediate attention from the movement, this one is it. Climate change laws: time to act on the IPCC report? The post Was the California drought geoengineered to pass future ‘climate change’ legislation? appeared first on Storyleak. Posted in ChemtrailsTagged Chemtrails, geoengineering, HAARP, hegelian dialectic, Chemtrail Syndrome, Chemical Assault, Chemical Trespass, CAFOs, California droughtcommentLeave a Comment on Was the California drought geoengineered to pass future ‘climate change’ legislation? DHS is influencing America’s TV shows, movies, electric cars and much more!